HTL, supplier of controlled bolting, flange working and portable machine solutions have launched another bolting industry first; therentals app;ihire. ihire follows the recent releaseof the new rentals catalogue from HTL, both featuring a comprehensive gallery of HTL’s readily available product range to solve the everyday and more complex challenges faced in the industry. Free to download, ihire makes equipment availability as simple as possible by providing instant and easy access to HTL products from your smart device. A built-in enquiry basket functionality allows users to easily add products to a basket and submit the enquiry directly to HTL. 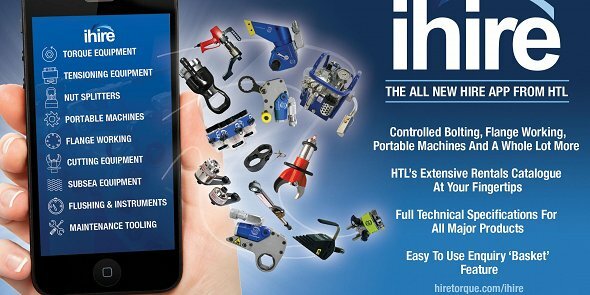 The user friendly HTL app features product categories such as torque equipment, tensioning equipment, nut splitters, portable machines, flange working, subsea, flushing instruments, maintenance tooling and many morecomplementary product lines suited to a range of sectors. Known for deliveringa customer driven rental portfolioin parallel with innovative new products, the dedicated HTL app was a natural step to continue the journey of commitment and growth. To download ihire, simply visit the App Store or Google Play. For further information please visit hiretorque.com/ihire, or email info@hiretorque.com.